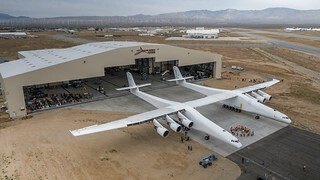 Stratolaunch aircraft by Stratolaunch Systems Corp., Mojave Air and Space Port. It will take off in 2019. The plane would carry loads, like a satellite, to the low-altitude earth orbit.